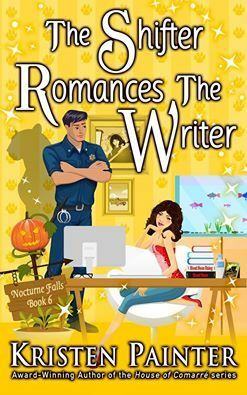 The Shifter Romances the Writer is the sixth book in Kristen Painter’s Nocturne Falls series and can I just say the title alone had me intrigued. Roxy St. James is a romance writer and let’s just say she is one awesome character. I’m so glad that Kristen Painter wrote a character with the occupation of a romance writer. I also really liked Roxy’s personality in the story. She had moved to Nocturne Falls to start over, especially since she is trying to finalize her divorce. Her crazy ex didn’t want to finalize it, instead he wanted to make her life difficult. Alex Cruz is a officer in Nocturne Falls and he happens to meet Roxy, when he gives her speeding ticket. He’s one interesting character due to the type of shifter he is and how caring he is to Roxy, even when he hardly knows her at first. Kristen Painter created another story in my favorite fictional town that was hard to put down. Oh, I could brag how much I adore Roxy and Alex. They did have a insta-love, but both Roxy and Alex didn’t make it too instant. They kept their feelings hidden for a while, until they had friends and family start noticing they should be more. There was instant that Roxy is upset with everyone and she has every right to be and I leaned towards her reaction over who betrayed her. Roxy was a strong character. The woman knew how to handle Alex’s brother. I definitely didn’t think she would overreact like everyone assumed. There was the issue of the drama with what was happening to Roxy since she moved to Nocturne Falls. I didn’t expect that kind of drama, but it definitely kept me turning the pages. It did happen quickly at the end. I give this 4 stars and highly recommend it to paranormal romance readers out there. You do not have to read these books in sequence since each book follows a different couple, but if you are like me, you’ll want to read in order. I do not like reading out of order. Plus I feel like I’ll miss out on the other characters that already had their story.